Verdict: Slightly above average. Pretty solid. The inaugral issue of the Pacific Revolution brand was a chance to show the world that Pacific, as a company, were worthy competition in a world already saturated with Upper Deck, Score, Pinnacle, Leaf, and countless others. Pacific came out of the gates with a true slapshot of a product. LEt me start off by saying that the base cards are quite possibly the most beautiful base cards ever created in hockey products. They are sparkly, high-resolution, and put even the newest Upper Deck and Panini designs to miserable shame. 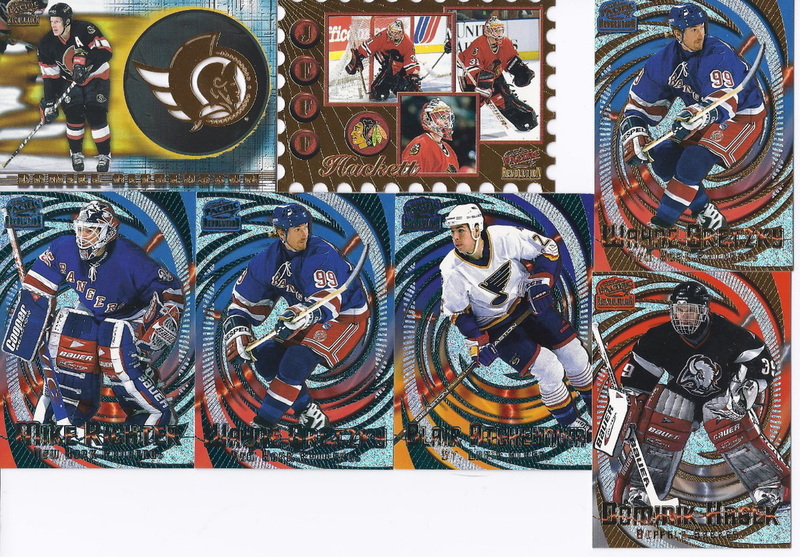 The inserts were experimental and highly inspired (look at the Hackett or the Alfredsson in the picture below for proof), and though the big hits were not really existent at this time, like many products of the same year, Pacific made sure to make some bang for the buck. There were no jerseys or autographs, this was a time for the true collector and it showed. No big hits, nor the quantities which modern collectors are used to, so that may be a deterrent for some. Overall, I would rate this product a 3.5 out of 5 as it impressed me quite a bit, as it showed what Pacific would offer in the future. Verdict: Very mediocre. Not bad, not very good. Another shot at expanding their ever-increasing market, Pacific released their inaugral Omega product in the 97-98 season. Unfortunately, I had the opportunity to open a box of it right after Revolution, so the review may be biased based on the comparision. First off, per the Pacific standard, the product is beautifully designed and its inserts are once again experimental and interesting. 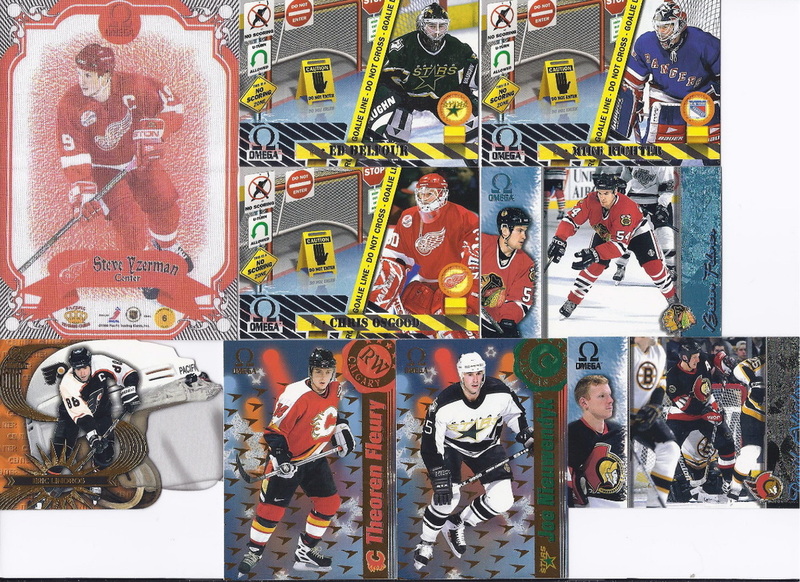 The Yzerman linen card, and Lindros die-cut helmet card, are of particular interest (see below). There are also parallels in each pack. Honestly, the product was a bore to open compared to Revolution. There was too much repetition in the base cards, the parallels were not really THAT different from one another and the names of the players were tough to read on several of the cards. Unusual for a Pacific product, I actually wanted the break to end so I could move onto a more fun box. It was certainly a good first try, but based on my other breaks of future editions of Omega, the product was never really perfected. Overall, I would rate it as a 2.5 out of 5 because of its trademark Pacific flair, that was much weaker in comparison to other Pacific products from the same year.